Welcome to our SlotsPlus Casino review! Please don’t forget to contribute to the page by sharing your honest experience with other OnlineCasinoBluebook.com readers. SlotsPlus Casino is an outstanding casino that offers hundreds of different online gaming options for players all over the world. The gaming platform is easy to use, and they currently offer two main ways to play. There is a downloadable version, giving players great casino software at their fingertips, and there is, also, an option to play online in instant play fashion. Slots Plus specializes in online slot games, as its name suggests, but has many other popular casino games to enjoy, as well. With nearly 50 different table games such as poker, blackjack, craps, Keno and Bingo, there is something here for everyone to enjoy. In fact, they have half a dozen different ways to play blackjack alone. There are 20 different video poker options, ranging from the popular Jacks or Better and Deuces Wild to various Stud and Bonus poker games. Some may be deterred by the idea of using an online casino feature because of the security of payments and their personal information. Fortunately, SlotsPlus has several measures and functions that ensure that players are safe using the casino. These security features ensure comfort for the player, knowing that both the player’s identity and funds will be protected at all costs. Loyalty is a virtue, this is a general principle that most people recognize, and it extends even to the relationship between a player and the casino. 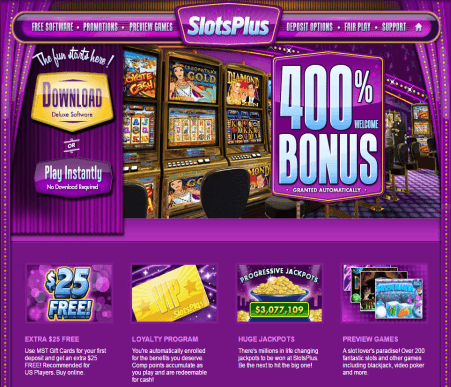 And at SlotsPlus, the player is rewarded with a loyalty program where the more they play, the more they will earn. As the player is promoted from silver to gold to platinum, they will see a higher weekly bonus. And, yes, the bonuses are weekly. There is even a bonus simply for signing up and making the first deposit. There is nothing more frustrating than having a problem and not being able to get a hold of someone right away to resolve it. Decent customer service can be found anywhere, but it takes a special place to provide exceptional service. SlotsPlus is a company that understands this and goes above and beyond to address and resolves issues as quickly as possible. With 24 hours, seven days a week service through the live chatrooms, there is always someone available to provide you with help. For less urgent matters, email is another way of contact. There are no casino fees for making a deposit into the account. The methods of deposit are very straightforward and accessible. Anyone will be able to make a deposit. The primary method is via credit, debit or gift card, such as Visa and MasterCard. The maximum amount that one can deposit via this method is $500, while the minimum is $25. Players can use an MST Gift Card, with the minimum being $20 and the maximum being $500. If a player would like a higher maximum deposit, one may opt for Neteller, which allows for a maximum of $2,500 deposit and a minimum of a $10 deposit. Finally, players could use a money order, with a $10 minimum and a $1,000 maximum. These options are efficient and safe. They also guarantee that players will be able to receive their money even if the funds are not sent directly to a bank account. When it comes time to make a deposit or withdrawal into an online account, it is critical that trust is established, especially for significant amounts of money. SlotsPlus adheres to strict legal guidelines put into place to protect not only the security of the players but also their identity as well. SlotsPlus has already developed a reputation for being an extremely trustworthy online casino, and its following of devoted players and satisfied customers are proof of this. The SlotsPlus office is in Panama City, Panama and they are licensed in the gambling jurisdiction of Costa Rica. They are fully licensed to conduct an online gambling website and operate within the compliance of all the local laws. SlotsPlus should be considered a top-tier online gambling website. With interactive gaming, a host of bonuses and customer appreciation programs, they bring the casino experience. They have earned a top rating for many reasons. 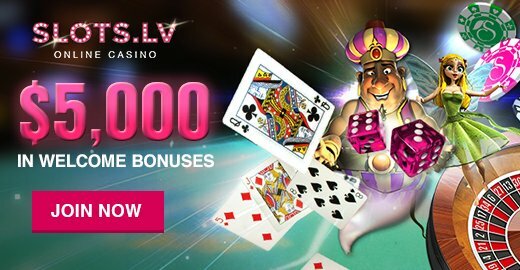 SlotsPlus has great bonuses available for their players, and their VIP program is one of the best you will find in an online casino. The graphics that are used in the games are incredibly detailed and well done and help to make the whole experience more realistic. SlotsPlus provides some very substantial jackpots on many different games, and there are titles and versions of games here that cannot be found elsewhere. With the availability of downloadable software to provide optimal gaming, and customer service available 24/7, it would be hard to find another site that would provide a similar experience. Thank you for reading our SlotsPlus Casino review!